The Palm Coast Golf Course a.k.a the Palm Harbor Golf Course was first Designed by Mr. William W. Amick, ASCGA Golf Course Architect. 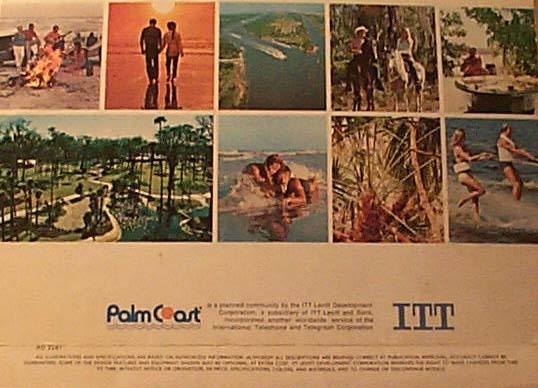 Historically, ITT Levitt offered an official 'Guided Tour' of Palm Coast. 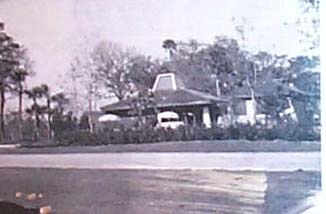 The little bridge on Club House Drive was not constructed early on. This little bridge would eventually *link* the not yet completed, Yacht Club, the Swim Club, and The Tennis Club However, the 'Boat to Dock' Dock and the Nine Holes of Mr. William W. Amicks' Golf Course were completed and comprised the earliest 'Guided Tour'. The Welcome Center Tower was the first Building which overlooked a lot of his designed Course. Also, there were Four Chris Craft Watercraft Taxis/Shuttles which departed from 'The Welcome Center Tower', and early Prospective Buyers could shuttle by Boat, around 'The Island', to the 'Boat to Golf' Dock. The "Guided Tour' Boat Shuttles departed from the two docks at the Welcome Center. Prospective Buyers were taken to the 'Boat to Golf' Dock adjacent to Mr. Amicks' designed 'Putting Green', just behind or in front of his 'Contemporary Clubhouse' , depending on your perspective, and this was just one of the Amenities pledged by the Developer. It was such a novelty to 'Boat' over to the Clubhouse and Golf Course! Early on, the Canals were *plugged'. A few of the early Canal Lot Homeowners, had Boats anyway, and would 'Boat' over to Play Golf and / or socialize in his 'Contemporary Clubhouse' once it was completed. In time, the little bridge on Clubhouse Drive was completed and Prospective Buyers could then see and take 'The Companys' FULL official 'Guided Tour' of the Mr. Amicks' designed Golf Course, the Yacht Club, The Swim Club, the Tennis Club, over to the Bon Terre Dock and onto and the Beachside Sheraton. In only a few years 36,000 LOTS were $old when all that we first early on prospective Buyers could see was the Welcome Center Tower and the 'Exhibit Area' of Model Homes and Mr. Amicks Golf Course. Very early on, we first Palm Coast Pioneers had no place to meet other than the first Neighborhood Park, adjacent to the Golf Course. In time, the Contemporary Clubhouse was finished and we moved on and met there. Later, the Model Homes/buildings in the'Exhibit Area' were offered to us fby the Developer or meetings, etc. When there was only a handful of Palm Coast Pioneers, we would all bring a Lawnchair - Colonel Wickland would raise his Flag, ring his Towne Crier Bells and say..'Oyez..Oyez..Oyez...Bring a Lawnchair..' and we met in the little first Neighborhood Park. In time, Mr. Amicks' Clubhouse was finished..and it had a roof and ceiling fans so we moved the meetings to there. These are the areas where the Palm Coast Civic Association started! 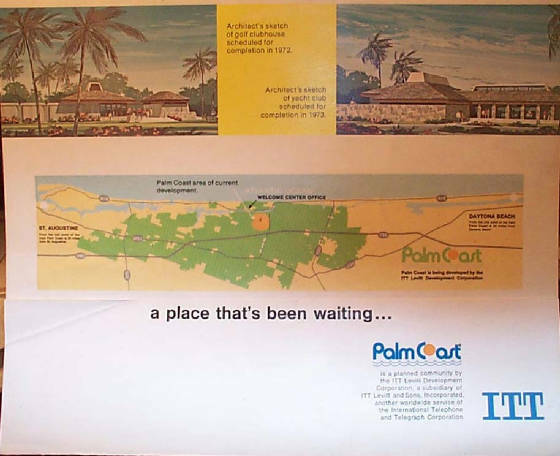 We first Original Palm Coast Pioneers were a salty bunch - Hell, we wanted the pledged and promised Shopping Center and I - 95 interchange and all the other Amenities that were pledged and promised - and we eventually got them all! Early on, there was indeed a *stagecoach* which was a blessing since it shuttled goods and mail back and forth for the *Pioneers*! Thank you Mr. Amick for designing such a nice course, and, for helping Palm Coast to get started. Dr. J. Norman Young - 1969 - 1975, was the 'Father of Palm Coast'; consequently since Mr. Amick and his Designed Golf Course help sell so many LOTS via the 'Guided Tour, he must be 'The Nephew of Palm Coast'. Thank you Mr. Amick for your '...beautiful rolling Golf Course...'. Please note the above picture, middle, extreme left. That is the view from the Welcome Center Tower, overlooking the'Exhibit Area' and Festival Park. In the background you can see Mr. Amicks' Golf Course. In the foreground lower right, a water feature leading to one of Two Waterfalls around the Welcome Center Tower. 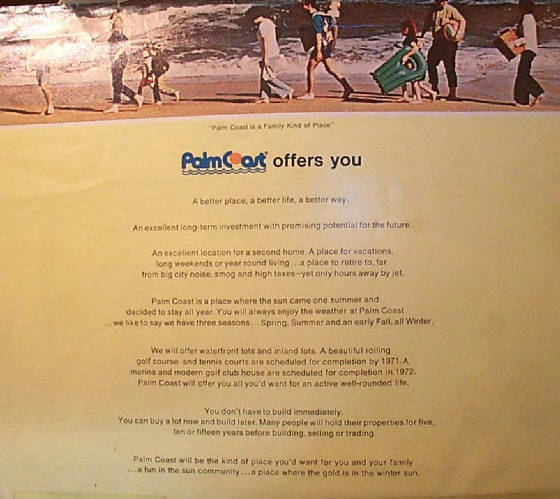 This is what we Prospective Buyers first saw; no wonder its beauty prompted us and early on, 36,000 people to 'Buy" and for us, lead us down the path to become "Palm Coast Pioneers'. B/W Polaroid Picture of the Original Clubhouse which was part of the 'Guided Tour' offered by ITT. We will continue to be Stewards of all this Information and Items, hoping for a Museum like Flagler Beach already has, hoping for a Certified Local Government like so many other Florida Leadership Cities already are.